Shoot what you carry for less! 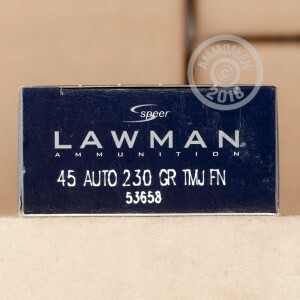 If you carry Speer Gold Dot hollow points in your .45 ACP pistol, consider picking up this 1,000 round of .45 ACP Lawman rounds to save money on your range practice. 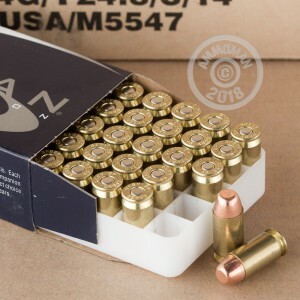 While Gold Dots are one of the more reasonably priced defense rounds available, Lawman rounds cost even less and are specifically designed by Speer to replicate the ballistic performance of various Gold Dot loads. Like other rounds in the Lawman series, this .45 ACP version uses a 230 grain total metal jacket (TMJ) bullet that encapsulates the entire lead core and reduces potential lead exposure for the shooter. 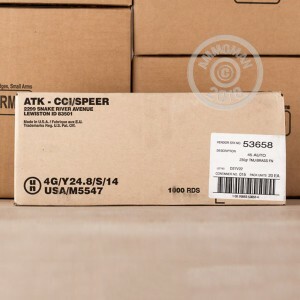 These rounds use reliable CCI non-corrosive Boxer primers and reloadable brass cases. Owners of firearms with ported barrels should be aware that TMJ bullets like the ones in this ammunition may shear in their guns. For all other firearms, TMJ bullets are a great alternative to FMJ ammo. Buy this case, or any other items priced over $99 at AmmoMan.com to qualify for our free shipping promotion, which has helped thousands of our customers save on large orders.